Products of Phoenix Artisan A.
Phoenix Artisan Accoutrements was born from the joining of two young talents: the experience in elaborating unique products by Frances and the imagination and creativity of Hodges. 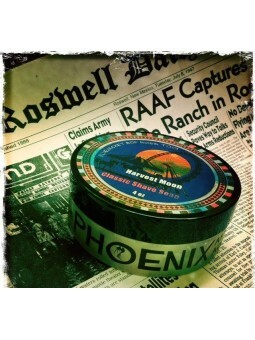 Together, they have given Phoenix Artisan Accoutrements shaving soaps prestige and have won over thousands of classic wet shave enthusiasts all over the world. If you are yet to try Phoenix Artisan products be prepared to be blown away! Artisan Accoutrements CAD Phoenix Shaving Soap 114gr. Artisan shaving soap developed to generate a thick and rich foam that will make your shave a really enjoyable experience. CAD is a soap that performs excellently and is long-lasting. The blade slides over the skin easily with a sensation of protection and an unbeatable post shave feeling. CAD recreates the aroma of the classic American Barber Shop, unique, fresh and clean. Fill your senses with memories of tins of cream and shiny straight razors. 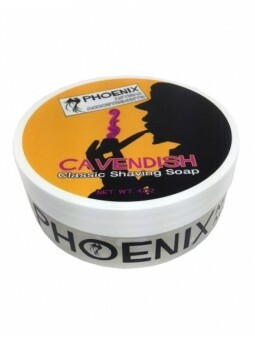 [manufacturer_name] => Phoenix Artisan A.
Artisan Accoutrements Cavendish Phoenix Shaving Soap 114 gr. Artisan shaving soap developed to generate a thick and rich foam that will make your shave a really enjoyable experience. Cavendish is a soap that performs excellently and is long-lasting. The blade slides over the skin easily with a sensation of protection and an unbeatable post shave feeling. Cavendish reaches you during your most intimate moments. It is a classic fragrance of sweet tobacco accompanied by a soft freshness. Marvelously simple. Artisan Accoutrements Classic Shaving Razor Bakelite Phoenix Black. The Bakelite was born in 1907 in the USA and was created by Leo Baekeland. It arose from the need to find highly resistant materials at low costs. After nearly 2 years of development searching for the most practical design Phoenix Artisan Accoutrements has launched its Bakelita 3-piece shaving razor Slant head/twist head and open comb. Keeping its design inspired in the classics, the weight and dimensions have been calculated to create a razor that offers closeness without being aggressive on the skin. The difference in metal razors and this one is that it requires a Little pressure, just a Little and adjust the angle to optimize the slanted design and get the best performance. 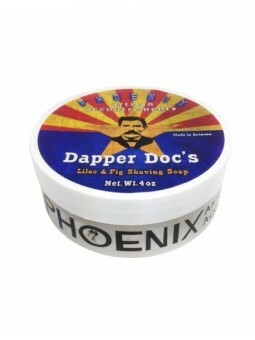 Artisan Accoutrements Dapper Doc Phoenix Shaving Soap 114gr. Artisan shaving soap developed to generate a thick and rich foam that will make your shave a really enjoyable experience. Dapper Doc is a soap that performs excellently and is long-lasting. The blade slides over the skin easily with a sensation of protection and an unbeatable post shave feeling. Dapper Doc, was a gunslinger, agile and witty. He is the inspiration for this elegant, Victorian inspired aroma, particularly masculine. With a base of lilac and fig culminating in exotic eastern spices. Artisan Accoutrements Harvest Moon Phoenix Shaving Soap 114gr. Artisan shaving soap developed to generate a thick and rich foam that will make your shave a really enjoyable experience. Harvest Moon is a soap that performs excellently and is long-lasting. The blade slides over the skin easily with a sensation of protection and an unbeatable post shave feeling. Harvest Moon puts you in a sensual mood that filters through the gaps of one world to another. Rhetorical replies, a veil, festive paper lanterns, a secret, a witness to a conspiracy. Complex yet easily classic. Green Tobacco, Black Cusolstice rant, tobacco Absolute, Peru Balsam, Smoke, Hay, Spanish Moss and White Sage. Artisan Accoutrements Malbolge Phoenix Shaving Soap 114gr. Artisan shaving soap developed to generate a thick and rich foam that will make your shave a really enjoyable experience. Malbolge is a soap that performs excellently and is long-lasting. The blade slides over the skin easily with a sensation of protection and an unbeatable post shave feeling. Malbolge, a dark, spicy blend that fusions notes of tobacco, citrus, anise, musk, patchouli, sugar and black pepper. Authentic “witchcraft” that is sweet, spicy and daring. It is a strong aroma that rapidly uncovers its magic. Artisan Accoutrements Solstice Phoenix Shaving Soap 114gr. Artisan shaving soap developed to generate a thick and rich foam that will make your shave a really enjoyable experience. Solstice is a soap that performs excellently and is long-lasting. The blade slides over the skin easily with a sensation of protection and an unbeatable post shave feeling. Solstice is a magic blend of aromas. 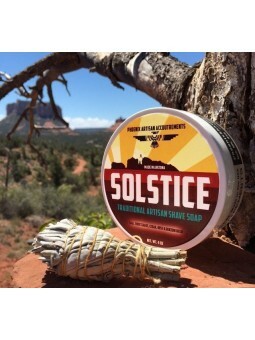 A collection of the Arizona desert essences that emulate the mysterious rituals of the Native Americans. Desert sage, cedar that was offered to fire to keep sickness at bay, oak, Sweet grass singular and sweet it grows wildly in the Rockies and reminds us of the mountains and outdoors, Benzoin R, an antiseptic that strengthens the mind. A powerful formula that will take you back to the magic of primitive cultures. Gondolier Classic Artisan Shaving Soap Phoenix Artisan Accoutrements 114gr. 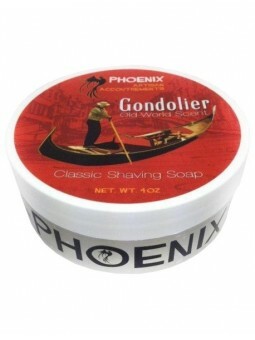 The Gondolier Phoenix Artisan Accoutrements Shaving Soap is a handmade shaving soap that produces a thick rich lather that will make your shave a true pleasure. Enjoy this very special, long lasting soap. The best glide for the blade with a great feeling of protection and post-shave. Gondolier classic, masculine, old world scent of Italy with every shave. The latest and most sophisticated scent to date,. A rich, balanced bouquet of Rose, Jasmine, Oakmoss, Coumarin, Citronella, Juniper & Cedar. Vegan product, handmade. hot process that maintains the quality and properties of the formula, produced in small batches. Phoenix Artisan Accoutrements Cavendish After Shave & Cologne 100ml . This After Shave was created looking for a brilliant formula strong enough to be used as a traditional cologne and gentle enough to also be used as an aftershave. Classic, simple and long-lasting fragrance. Masculine sweet tobacco aroma that is combined with fantastic fresh touch. INGREDIENTS: Alcohol, Rose Water, Aloe, Glycerin, Alum, Essential / Fragrance Oils. Phoenix Artisan Accoutrements Harvest Moon After Shave & Cologne 100ml. Sophisticated aroma.A sensual mood seeping through the cracks of one world into the other. Rhetorical answers, a veil , festive paper lanterns, a secret witnessed by a smug. Dark and complex but easily classic. The encounter between a mysteriously fragranced and long-lasting cologne and the benefits of an after shave with a surprise post shave feel. Ingredients: Spanish Moss Hydrosol, Glycerin, Hedione, Liquid Silk, Carrot Seed Extract, Aloe Vera and White Sage Hydrosol. Oud (Agarwood), Green Tobacco, Black Currant, Tobacco Absolute, Hay Absolute, Peru Balsam, Smoke, Spanish Moss, White Sage.Alcohol. 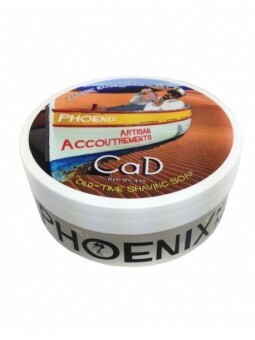 Phoenix Artisan Accoutrements CAD After Shave & Cologne 100ml is a very special concoction with a well-thought formula. The scent needs to be long lasting but at the same time delicate and gentle on the skin. This fragrance contains Alum and Menthol but there is also more depth to the scent profile with Rose Water. Together they provide all with a most excellent and unique post-shave feel while the slight menthol kick wakes you up and creates a relaxing dry down effect! Phoenix Artisan Accoutrements Aftershave Cologne Dapper Doc 100ml. This After Shave Cologne takes your shaving experience to the next level. A unique product that combines the two essentials after shaving products: the after shave and the cologne are presented in a unique format. Its masculine scent takes us to the old West. Floral notes that take us to the sandy paths of cow-boys times. Notes of lilac and fig that are perfectly combined with touches of aloe and alum. The Dapper Doc After Shave Cologne is the perfect final touch for the every day masculine hygiene. Its fragance will give you freshness and personality. A fragrance thought for gentlemen that are looking for a rebel touch in their every day life. Presented in a 100ml bottle. Phoenix Artisan Accoutrements Aftershave Cologne Gondolier 100ml. This After Shave Cologne takes your shaving experience to the next level. A unique product that combines the two essentials after shaving products: the after shave and the cologne are presented in a unique format. Its masculine scent takes us to Italy. Floral Citric notes that take us to the Venice canals. Notes of bergamote, rose and jasmine, that combine perfectly touches of oak moss, coumarin, citronella, juniper and cedar. The Gondolier After Shave Cologne is the perfect final touch for the every day masculine hygiene. Its fragance will give you freshness and personality. It has been on of the best-sellers of the brands for 5 years. Gondolier will give you an aromatic harmony that will surprise you. Phoenix Artisan Accoutrements Classic Shaving Razor Alpha Ecliptic Slant Aluminum Black. The Alpha Ecliptic Slant Razor – Aluminium Black is truly a 100% tribute to the original classic and very rare, Walbusch & Sohnes Humpback Razor. Same geometry, tolerances and material. Made out of 7075 aluminum to stay true to the original designs lightness but with the added durability. The weight is key to the precision of the razor. The razor features a unique design which helps guide the user to the proper blade angle for an almost effortless shave. The blades ´position allows their best performance. Barely aggressive for the skin, it reaches incredibly efficient results.An ideal tool for new sensations for experienced shavers. 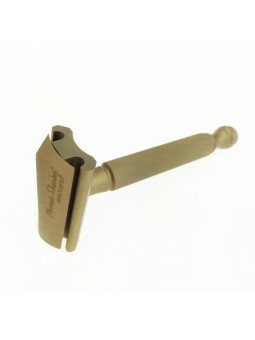 Phoenix Artisan Accoutrements Classic Shaving Razor Alpha Ecliptic Slant Aluminum Bronze. The Alpha Ecliptic Slant Aluminium Bronze is truly a 100% tribute to the original classic and very rare, Walbusch & Sohnes Humpback Razor. Same geometry, tolerances and material. Made out of anodized aluminium and Antique bronze color, to stay true to the original designs lightness but with the added durability. The bronze color adds a touch of elegance to this fantastic razor. The razor features a unique design which helps guide the user to the proper blade angle for an almost effortless shave. The blades ´position allows their best performance. Barely aggressive for the skin, it reaches incredibly efficient results.An ideal tool for new sensations for experienced shavers. Phoenix Artisan Accoutrements Classic Shaving Razor Alpha Ecliptic Slant Ox Blood. The Bakelite Alpha Ecliptic is truly a 100% tribute to the original classic and very rare, Walbusch & Sohnes Humpback Razor. Same geometry, tolerances and material. It is made out of bakelite, one of the classic material famous for its strength. The razor offers a unique design that helps the user to find the perfect blade angle for a perfect and effortless shave. The blades ´position allows their best performance. Barely aggressive for the skin, it reaches incredibly efficient results.An ideal tool for new sensations for experienced shavers. Phoenix Artisan Accoutrements Classic Shaving Razor Bakelite White. The Bakelite was born in 1907 in the USA and was created by Leo Baekeland. It arose from the need to find highly resistant materials at low costs. After nearly 2 years of development searching for the most practical design Phoenix Artisan Accoutrements has launched its Bakelite 3-piece shaving razor Slant head/twist head and open comb. Phoenix Artisan Accoutrements Classic Slant Safety Razor Bakelite. The Bakelite was born in 1907 in the USA and was created by Leo Baekeland. It arose from the need to find highly resistant materials at low costs. After nearly 2 years of development searching for the most practical design Phoenix Artisan Accoutrements has launched its Bakelite 3-piece safety razor Slant head/twist head and open comb. Scuttle Crown King Phoenix Artisan Accoutrements. Ceramic shaving bowl inspired in the shaving mugs of the Old West. There is nothing like a hot lather from the moment you start your shaving ritual right to the end. Maintaining the original design, its functionality has been improved thanks to the studied improvements. Eight vertical “digs” have been added that give the product extra resistance and the horizontal lines work harmoniously together for optimum balance and performance. The traditional cork stopper has been replaced by one made of silicone that resists the passing of time and allows for a watertight seal that guarantees to keep the water warm throughout the whole shave. The warm foam allows for a more comfortable and closer shave. The fact that the water is kept warm throughout the whole process avoids a cold brush that difficults shaving and damages the skin. To achieve the best results: Fill the top part of the container with very hot water and leave the brush to rest inside for 5-10 minutes. Before lathering empty the water from the top part and fill the bottom chamber of the Scuttle with very hot water. Put your chosen soap on the brush and lather in the bowl using circular movements and a little pump action. Boiling water can cause small cracks and stress marks in the porcelain. Phoenix Artisan Accoutrements Travel Scuttle Crown King. PVC shaving bowl inspired in the shaving mugs of the Old West. There is nothing like a hot lather from the moment you start your shaving ritual right to the end. Maintaining the original design, its functionality has been improved thanks to the studied improvements. Eight vertical “digs” have been added that give the product extra resistance and the horizontal lines work harmoniously together for optimum balance and performance. The traditional cork stopper has been replaced by one made of silicone that resists the passing of time and allows for a watertight seal that guarantees to keep the water warm throughout the whole shave. To achieve the best results: Fill the top part of the container with very hot water and leave the brush to rest inside for 5-10 minutes. Before lathering empty the water from the top part and fill the bottom chamber of the Scuttle with very hot water. Put your chosen soap on the brush and lather in the bowl using circular movements and a little pump action. *Includes microfiber travel puch and neoprene scuttle glove.